“quickly built” trays for an upcoming crafts fair. 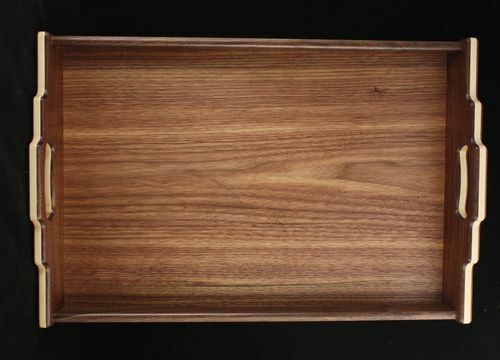 Black walnut with ambrosia maple and jatoba. Dimensions are 12” x 18”, 10 degree slant on the handles. Finish is danish oil and Homer’s tung oil finish (varnish). I ran into a few difficulties with the wood for these. I only had enough walnut scraps to complete two handles. Solution: I resawed the wood and added a layer of maple to beef the thickness back up, problem solved! The shapes were cut on the router table with a set of templates I had saved from previous projects, this saved some time. I used the same technique for the finger joints that I use in my boxes, 1” copper rivets. The bottom panels are 1/4” plywood that I further veneered with walnut. Real nice looking trays, Bruce. I like the laminated ends!! Splint, nice job with the G&G trays. I especially appreciated the wood stretching technique. Wow. These are really unique. Really like the design for the handles. Great projects that should grab attention at the crafts fair! I use serving trays to teach people how to wood work. It is the perfect project for them to learn all these different operations, and be done by the end of the weekend. 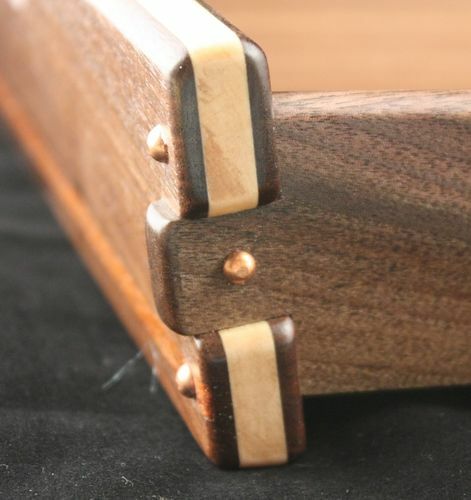 I am glad you did not have enough Walnut because it made your project unique. Very nice work. I think I will have my Grand son over to help make some of these that can be assembled later on this Thanks giving by my very young Nephews in Chicago. Then the Grand son can make one for his parents too. This is a really nice design. Very nice! The joints look awesome. You did a very nice job on these trays. Splinter – those turned out awesome, “quick” or not. The maple looks great as do the brass pins. I might just have to plagiarize your work, just a little bit…..